Forget about what Americans call “marinara”. Forget about store brought tomato sauce, with all that additives and salt. 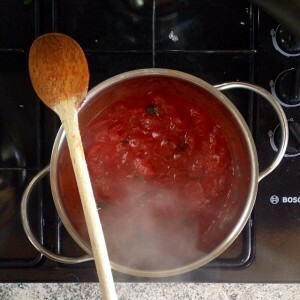 Simple, good ingredients and 30 minutes of your time: that’s all you need for an incredible tomato sauce! And it’s not an April’s fool! Heat the oil in a deep saucepan. Add the peeled and halved garlic. Add the basil. Let it fry, slowly, for 1-2 minutes: the garlic must be still white and basil leave must be a nice strong green. Add the canned tomatoes, add the tomato paste and sugar, stir, partially cover. Let it cook, over moderate eat (the sauce must bubble) for 20-25 minutes. Taste, season if you need to, serve! 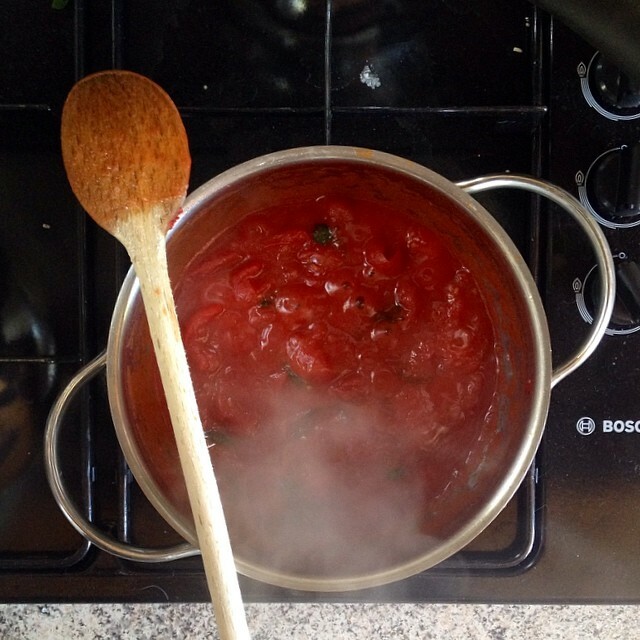 You can keep the tomato sauce in the fridge, in a glass container, for 4-5 days: always reheat before use. It’s perfect to top pasta, pizza or to add to casserole.